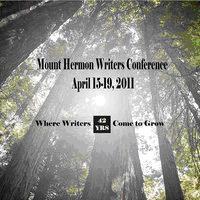 Last month, I attended the Mount Hermon Christian Writers Conference in northern California. Mount Hermon is a special place for me. Both times I’ve attended this writer’s conference, I strongly felt God’s presence. It’s hard for me to describe what Mount Hermon means to me. There are so many good things wrapped into 5 days. Sometimes it’s hard to distinguish what I learn about writing from what I learn about life. During my business career, I attended so many corporate conferences and conventions. I spoke at many of them. Looking back, these events drained me. I poured energy into them and got nothing in return. Sure, I was satisfied because I fulfilled my commitment, but that was it. I think that’s why the experience at Mount Hermon is so special to me. Yes, it is exhausting. I have to put on my extrovert hat for 12-14 hours per day for 5 days. It’s a roller coaster of emotions with ups and downs. But it energizes me. The experience gives me back as much as I give to it. I think that’s how you know when you’ve found your passion. Although the dress code is casual and the atmosphere is spiritual, business takes place at Mount Hermon. I enjoy learning about the business side of writing. I had the opportunity to meet editors from publishing houses, agents, and other freelance writers. As a newbie my first year at Mount Hermon, this aspect of the conference overwhelmed me. I was better prepared this year, and I used the opportunity to learn as much as possible and meet as many people as possible. I enjoyed getting feedback on my current book project. I came away from these discussions with a better idea of where I need to take the project and my ministry. I learn in leaps and bounds at Mount Hermon. The classes and workshops are amazing and full of advice and tips for better writing. Learning about the craft of writing is a continual process. I always come away from this conference as a better and more knowledgeable writer. I can see the growth in my writing skills and knowledge of the industry that’s directly related to attending classes at Mount Hermon. What’s the third thing I love about Mount Hermon? It deserves a post all its own. Check back on Friday for Part 2 of My Mount Hermon Experience. Don’t you just love going to a conference/workshop where you come out feeling like you actually learned something?! Sounds like you had a wonderful time. Can’t wait to read Part 2 of the story! Lorrie, thanks for commenting! Yes, I love conferences that fuel my passion. I bet you’re the same with the scrapping conferences/classes. And I totally agree about fiddling on the blog instead of writing on it 🙂 Sometimes that is more fun for me!